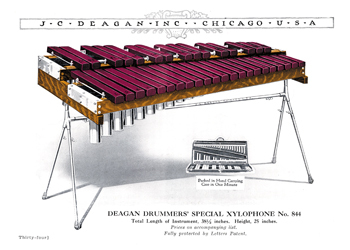 The J.C. Deagan company manufactured many different types of xylophones designed for a wide variety of uses. The Drummers’ Special was intended for use as an accessory to a drummer’s “trap set” during the hey-day of society orchestras. The instrument fit into one carrying case for ease of portability and was mounted on a short stand so that it could be played while sitting. This model, No. 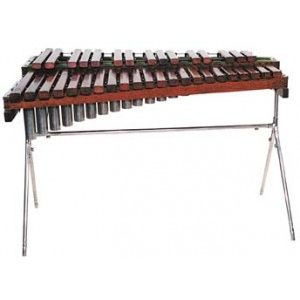 844, has a 3-octave range from C5 to C8, and was manufactured between the years 1915-29. The bars, made of select Honduran rosewood (trade name Nagaed, which is Deagan spelled backward) are 1 1/4 inches wide by 7/8 inches thick. 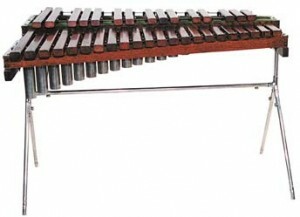 The instrument is 25 inches high and 38 1/2 inches long. The total weight is 27 pounds. 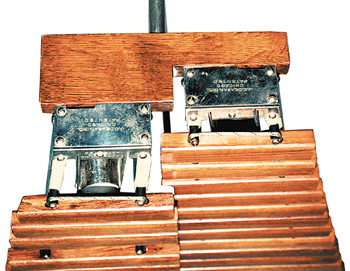 One could purchase optional extensions for the legs in order to play the instrument while standing.